Right, I know that basil works well with tomatoes and I have five or six tomato soup recipes that use it. 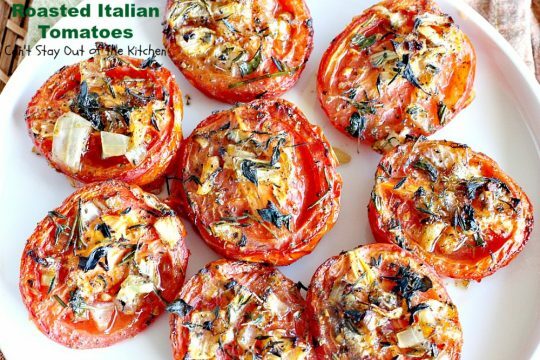 But these tomatoes have that delicious Italian flavor using other fresh herbs like oregano, thyme, rosemary and chives. Roasted Italian Tomatoes were absolutely delectable. In fact, this recipe was so good I made it about 3 times within the span of one week! First, I made it for friends we had over for dinner. They loved the tomatoes served this way. Truly, we each had several helpings. Then I made it a couple of days later for a potluck at our church. They were a big hit there too. I managed to scoop up a handful of tomatoes before the plate was cleaned out and took them to a lunch with a friend the next day. She loved them too. Every time I’ve made them, everyone has raved about them. 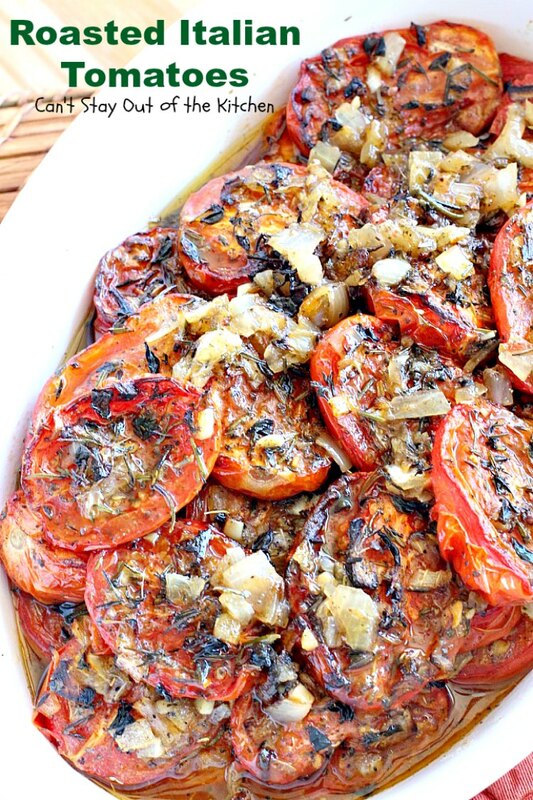 When I first saw this tomato dish I knew I needed to put it on my priority “make” list. I’m so glad I did. This is one of those recipes that just comes together so well and is such a hit with everyone that it becomes a family favorite. I know it sure will be one of mine! 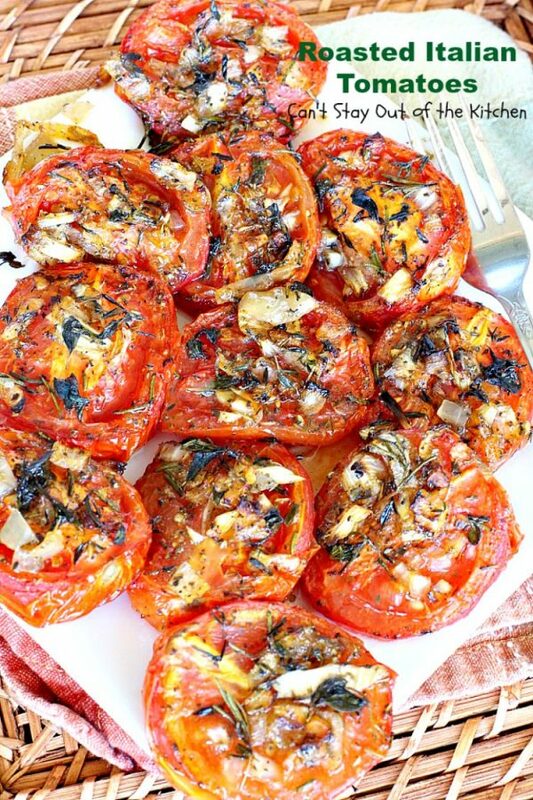 If you have a garden and you don’t want your tomatoes to spoil, it’s a doubly delicious recipe to have on hand. Besides serving for company and holidays it’s also a great recipe to serve for Meatless Mondays. 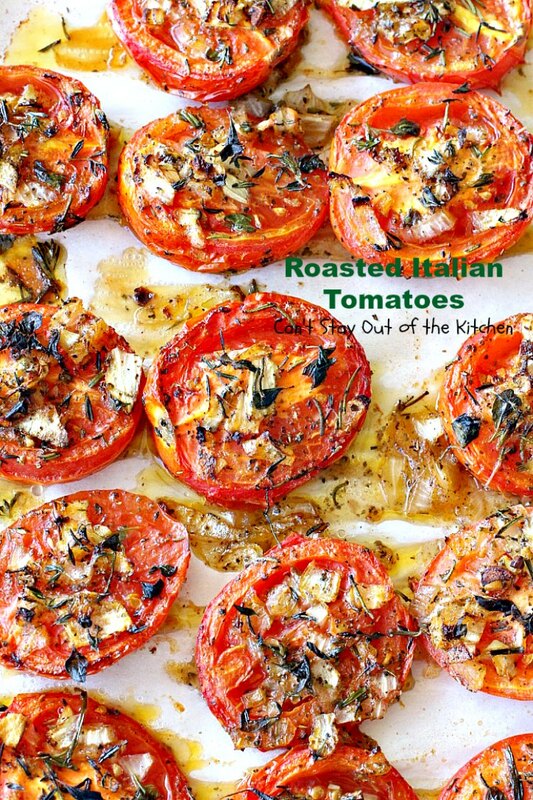 Roasted Italian Tomatoes are the real deal. 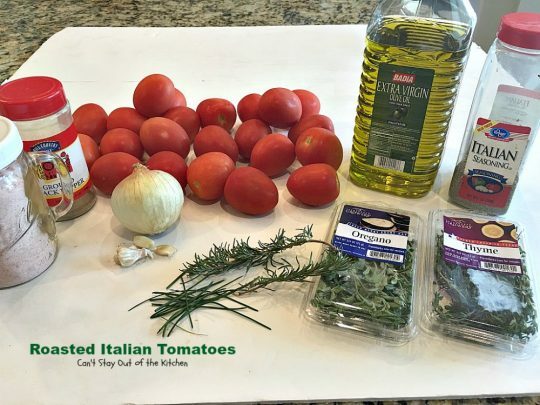 If you need to use up garden tomatoes, or want a scrumptious (low calorie) side dish for Thanksgiving or Christmas, I can’t recommend these tomatoes enough. They’re really easy and simple to make. They’re a lot better with fresh herbs, but if you can’t locate fresh, dried herbs will do in a pinch. Roasted Italian tomatoes are healthy, low calorie, gluten free and vegan for those who love to eat their food clean. Roasted Italian Tomatoes are heavenly. This is one of the best tomato side dishes I’ve ever eaten. 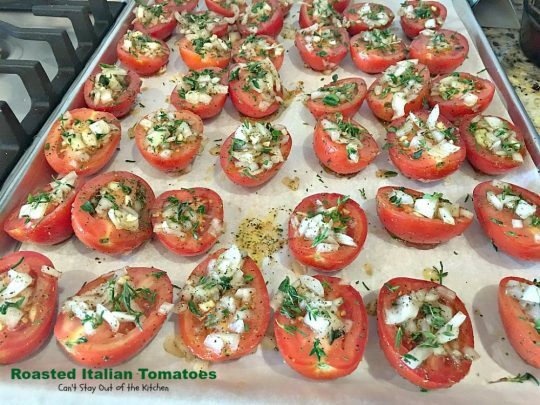 Roasted Italian Tomatoes are great for a holiday side dish too, especially if you’re trying to decrease calories! 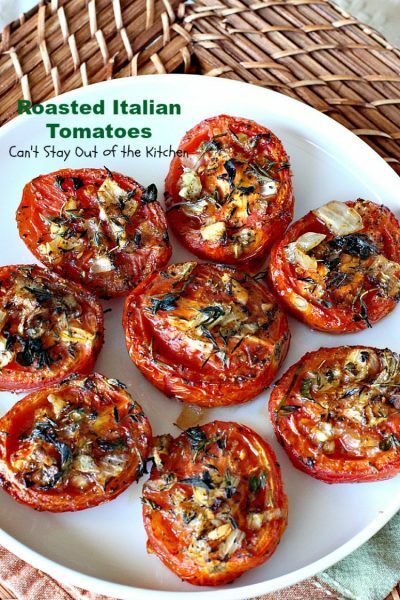 This is a great way to use up garden tomatoes. I used these ingredients. While I used olive oil, you can also substitute avocado oil if you desire. (The mason jar contains pink Himalayan sea salt). Slice Roma tomatoes in half lengthwise. Place in a very large mixing bowl with onions, garlic, Italian seasoning, sugar, salt and pepper. Drizzle with olive oil. Line a very large cookie sheet with parchment paper. 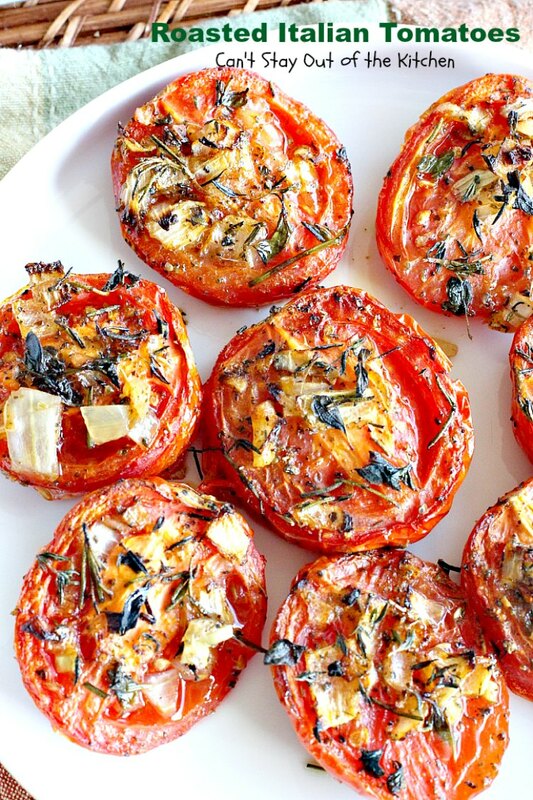 Place tomatoes cut side up on top of parchment paper. Scoop onions and garlic from bowl and heap over top of tomatoes. 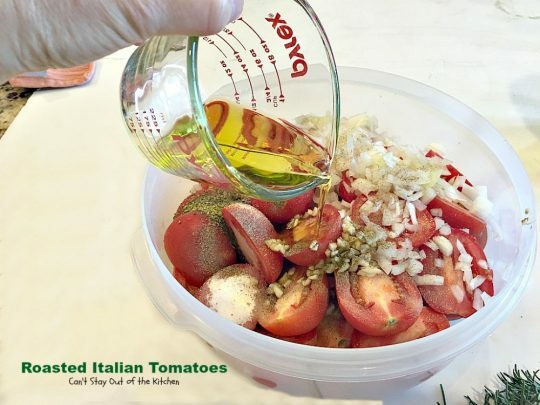 Drizzle any remaining seasonings or olive oil from bowl over top of tomatoes. Finely mince fresh oregano, rosemary, chives and thyme. 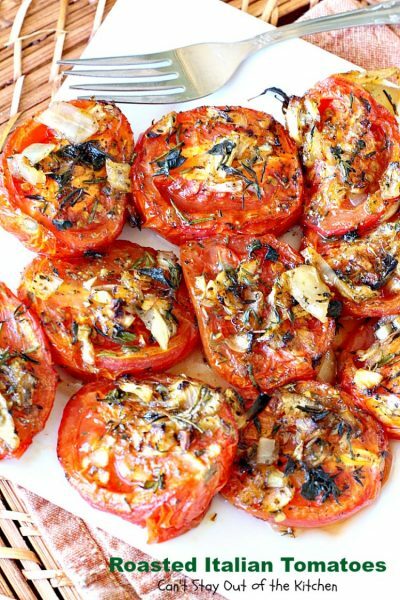 Sprinkle a little bit of each herb over top of each tomato. (I used two to three tablespoonfuls of each herb). Bake at 300 degrees for one hour. Increase temperature to 375 and bake an additional 30 minutes until tomatoes char and brown slightly. Remove tomatoes to serving dish, if desired. Serve Roasted Italian Tomatoes with your favorite entree. I served these with steak, baked sweet potatoes and a BLT Salad. This is also a great side dish for company. We couldn’t get enough of this vegetable. Everyone went back for second and third helpings. 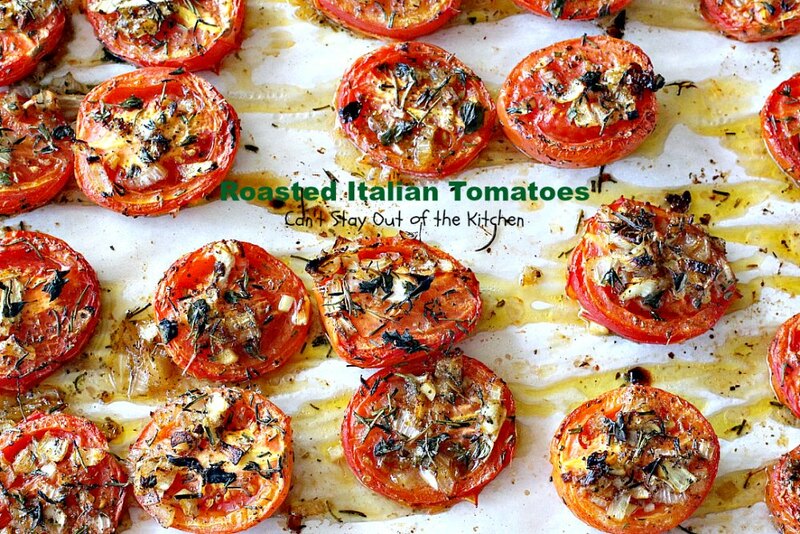 Roasted Italian Tomatoes are healthy, low calorie, gluten free and vegan. 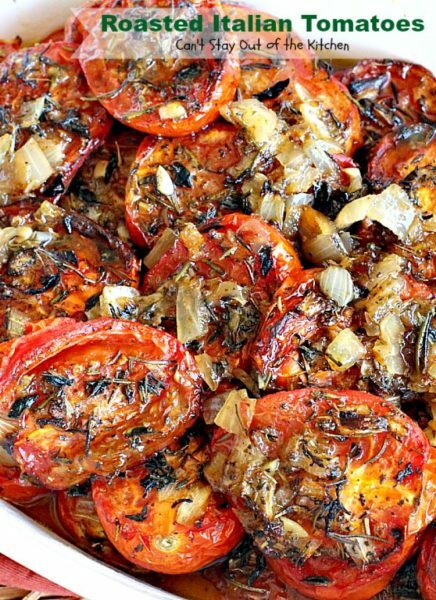 These succulent tomatoes use sweet onions, garlic, oregano, thyme, rosemary and chives and are baked until they are perfectly plump and delicious. Great holiday side dish. Gluten free, vegan, low calorie, healthy and clean eating. 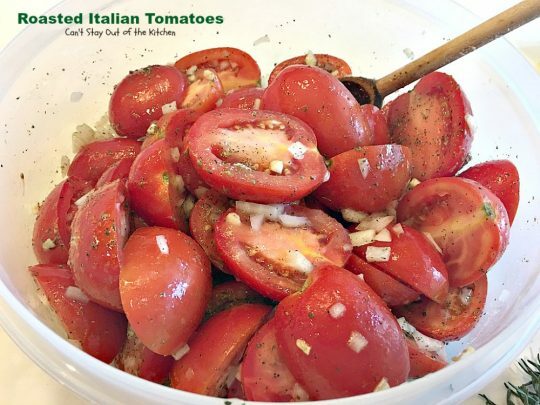 Place cut tomatoes, olive oil, garlic, onion, Italian seasoning sugar, salt and pepper in a large mixing bowl. Place tomatoes cut-side-up on top of paper. Spoon onion and drippings from bowl over top of each tomato as evenly as possible. Remove oregano leaves, thyme leaves and rosemary from stems and mince. Sprinkle over top of tomatoes. Snip chives and add as desired. Bake at 300° for about 1 hour. Increase heat to 375° and roast for about 30 more minutes until tomatoes char or brown slightly. Recipe adapted from Noshing with the Nolands. If you’re into eating Meatless Mondays, this is a great dish to present. These succulent tomatoes will have you coming back for more. The fresh thyme, rosemary, oregano and chives make these tomatoes so mouthwatering! Hi, Gay. Yes, these are some of my favorites. 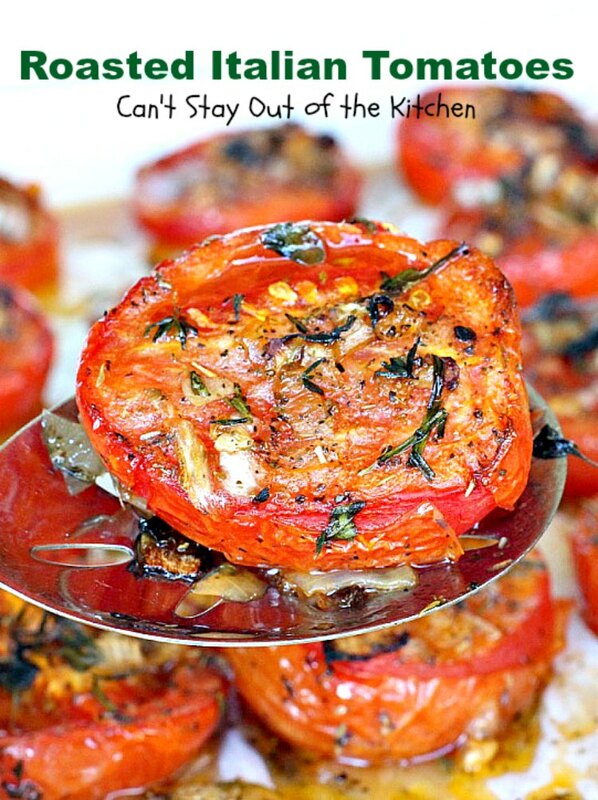 I make some version of these tomatoes all the time–especially for company. Everyone always loves them. Can I make them one day and heat up next day . I want to make them but I am working and won’t have time to bake that long . Hi Val. Yes, I’ve done that before. They taste great as leftovers. (You may have to drain off any excess water/juice from the tomatoes). Can you peel the tomatoes before baking? I don’t like cooked tomato skins. Hi, Carol. I’m sure you can, I’ve just never done it that way before. Not sure if the tomatoes will cook down too much and become mush, though. Just saying. Can you peel after cooking? can these be made ahead and frozen? I was googling appetizers to freeze and these came up, but no instructions on how to accomplish that. Hi, Cathy. I’m not sure I would freeze these. I’m afraid they wouldn’t reconstitute very well. You might find the tomatoes get mushy. These are terrific served right away, but I think it would be a real gamble to freeze them. Sorry. I can not wait to make these! My daughter is a great cook and I just want to once make something she can’t resist! This sounds like the one to do just do that! Thank you for sharing! Hi, Gerry. This recipe is soooooooo good. It’s absolutely one of our favorite recipes. I make it all the time and everyone always loves it.